Allahuakbar. Betul. Husnudzon itu memang sukar. Payah. Bukan mudah. Tak senang. Terasa banyak dosa. Oleh itu, bertaubat. Seringkali, ada sahabat2 saya meminta motivasi dan kata2 semangat dari saya. I think everyone have this skill, where you’re actually trying to say to yourself whenever others are asking for some advices. And most of the time, I told them “No matter how big your problem is, smile!” By choosing not to smile is not the best solution for your problems. Smile, calm down, have a good relationship with the people around you, ask for some advice and try your best to solve the problems. If you feel bad, do some reflection, and back to Allah. If you feel everyone is punishing you for something that is not actually your fault, back to the purpose of life, and back to Allah. If you feel sad, smile and back to Allah. Find back the purpose of life and why we’re created. Seek for Allah’s forgiveness. Have a positive mind. Allah will test you with something you can bear with it. insyaAllah. He will always provide the best for you! # No break between 2 postings. This is cruel. 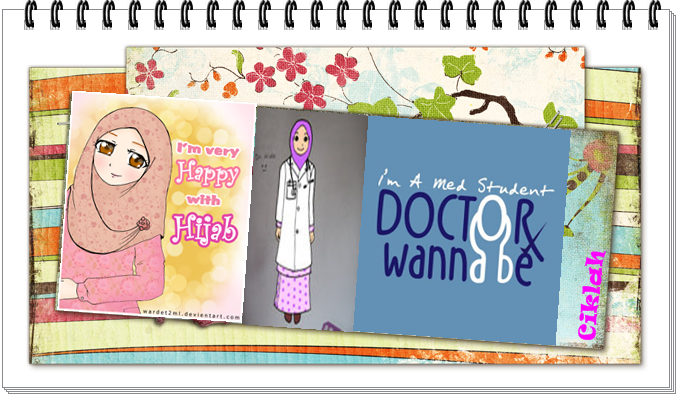 But it’s for our own good sake, to be a good muslim doctor insyaAllah. # Doing 2nd medical posting, hope to enjoy it with the addition of rheumatology and dermatology. # Bulatan gembira this week is a good heart therapy as well. Kepala tengah serabut. # Muslim doctor has to be strong enough to face every difficulty. Yosh! # Anthing happens, jangan sesekali rasa penat dengan perjuangan. Sikit baru Allah uji. Allahuakbar. "Kalaupun kita tak mampu nak membahagiakan orang, cukuplah kita tidak menyakiti hati orang lain"